Get some cultural insight at Sea Fortress Suomenlinna and Rock Church. Change things up with these side-trips from Helsinki: Bellevue Beach (in Hanko), Nuuksio National Park (in Espoo) and Fagervik Museum (in Inkoo). There's lots more to do: take a stroll through Katajanokka, go for a walk through Linden Esplanade, pause for some serene contemplation at Helsinki Cathedral, and get engrossed in the history at Seurasaari Island and Open-Air Museum. To find ratings, maps, other places to visit, and more tourist information, read Helsinki holiday planner. Sao Paulo, Brazil to Helsinki is an approximately 20-hour flight. You can also do a combination of bus and flight. Due to the time zone difference, you'll lose 5 hours traveling from Sao Paulo to Helsinki. Plan for colder temperatures traveling from Sao Paulo in December, with highs in Helsinki at 3°C and lows at -3°C. Finish your sightseeing early on the 26th (Sun) to allow enough time to travel to Saariselka. Get some cultural insight at Siida and Gold Prospector Museum. Change things up with these side-trips from Saariselka: Inari (Pielpajarvi Wilderness Church, Otsamo Fell, & more). 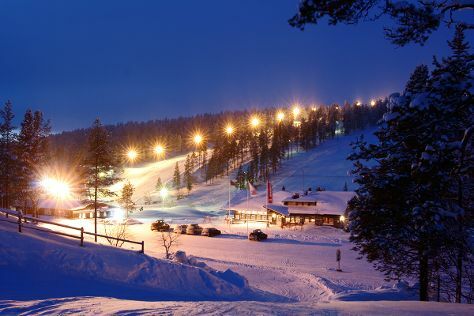 On the 29th (Wed), spend an exhilarating day on the slopes at Saariselka Ski & Sport Resort. To see more things to do, traveler tips, ratings, and tourist information, use the Saariselka trip itinerary maker website . Fly from Helsinki to Saariselka in 4.5 hours. Alternatively, you can do a combination of flight and bus; or drive. Expect a bit cooler weather when traveling from Helsinki in December: highs in Saariselka hover around -7°C, while lows dip to -17°C. Finish your sightseeing early on the 31st (Fri) so you can drive to Rovaniemi. Your cultural itinerary includes sights like Arktikum and Christmas House Santa. There's lots more to do: take an exotic tour of a safari tour, take in the architecture and atmosphere at Rovaniemi Church, browse the collection at Rovaniemi City Library, and see the interesting displays at Santa's House of Snowmobiles. To see traveler tips, reviews, more things to do, and tourist information, use the Rovaniemi trip itinerary maker website . Traveling by car from Saariselka to Rovaniemi takes 3.5 hours. Alternatively, you can take a bus. In December, daytime highs in Rovaniemi are -6°C, while nighttime lows are -13°C. Cap off your sightseeing on the 3rd (Mon) early enough to travel back home.